Turkish Vans are large cats with long bodies and powerful legs. 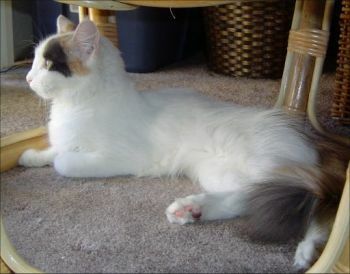 A Turkish Van has markings on its tail and head, but is otherwise completely white. Turkish Vans have semi long, seasonal coats that are soft and silky. Playful and energetic, Turkish Van are feline comedians. These curious and playful cats love to jump and climb, and also like to play with water. This breed originated thousands of years ago in the Lake Van region of Turkey (previously Anatolia). In 1955, Turkish Vans were exported to Britain by two British ladies, who then bred the cats for several years before returning to Turkey to purchase more Vans. Turkish Vans were first imported to the United States during the 1980s. This breed was named for the Lake Van region in Turkey, where these cats originated. Common nicknames include Van and Swimming Cat. Turkish Vans are very intelligent cats that love to be around people. Unlike most other types of cats, Turkish Vans are fascinated by water and may even swim when given the chance. Turkish Vans are instinctive fetch players and can be trained to walk on a leash and to do a variety of tricks. Turkish Vans are very energetic and active cats that like to play hard. Turkish Vans are people cats and like to be with humans. These cats are very active and also have a ravenous appetite. Playful and curious, Turkish Vans are very entertaining companions. While it’s a good idea to brush Turkish Vans daily, their coats are relatively easy to maintain. No breeders listed at this time.